Planting petunias is easiest when they are purchased as a mature plant that is ready plant outdoors or to be kept indoors. However, since petunias are annuals, this will need to be done each year, which can add up financially over the years. 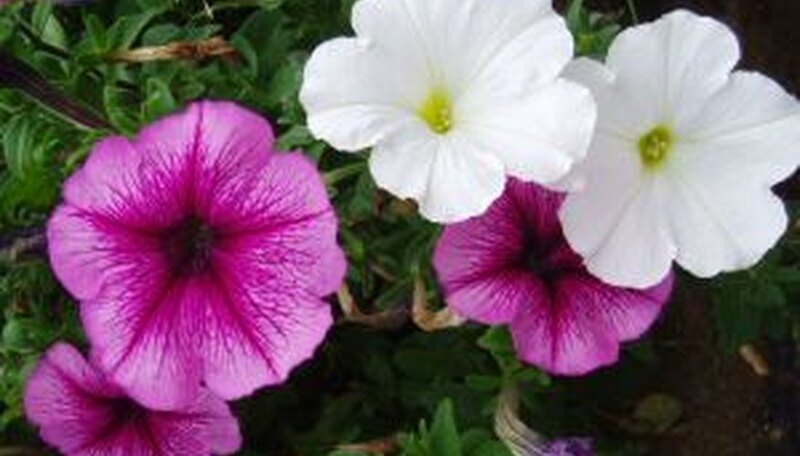 You can plant seeds that are much less expensive and then transplant the petunias to the outdoors when they’re ready. Or you can continue to grow them indoors. Start this process in March or April. Fill a container with soil that drains well and is rich. General potting soil will suffice. You can also use milled sphagnum moss. Spread a thin layer of petunia seeds on top of the soil and then push them into the soil with your fingers. Cover the container with plastic wrap and store in an area that bright, but not in direct sunlight. Take off the plastic and move the container in a sunny spot after the petunias sprout, which usually takes about a week to 10 days. Alternatively, you can place the container about 6 inches under a fluorescent light that is set to turn on for 16 to 18 hours. Keep the soil evenly moist. Transplant your petunias once the sprouts have leaves. Leaves can take several weeks to develop. Indoors, plant several plants together, several inches a part in one large container, if desired. Keep plants in an area of the home that receives about six hours of sunlight. Keep them evenly watered by watering about twice a week. At the end of the season, usually in fall, discard the plant. You can also transplant the petunias outdoors at this time as well.